With over 170,000 unwanted horses in the United States, according to the American Horse Council, the number of horses showing up at horse sales and horse rescues, or simply “turned loose on the range,” is increasing. As a result, the number of malnourished and skinny horses is also on the rise. Luckily, some of these horses are being adopted or rescued by good Samaritans. The trouble is that many good Samaritans have no idea how to feed skinny horses to restore them to health. If you are one of these good Samaritans then you know the temptation to “feed up” the skinny horse in attempt to restore him to his proper weight. Unfortunately, simply shoving tons of food in front of a skinny horse is unlikely to produce the results you want, since a thin horse is often unable to digest or process huge amounts of food due to a weakened digestive system. Instead of dumping tons of feed over the stall door, follow these three steps for feeding the thin horse. The first three causes are fairly simple to address and understand, but the fourth is less straightforward. A horse that has been stressed, injured, or is in pain may lose quite a bit of weight, because these conditions can cause the formation of ulcers or may cause digestive upset. For these horses, it is a good idea to address digestive problems with products such as Stomach Soother, SUCCEED, or KAM Ulcer Formula (KAM UF). Whatever the cause, once you have determined the health issues from which the horse may be suffering, the first step is to address those issues. For instance, if the horse has bad or broken teeth, you need to have his teeth floated before feeding him tons of food, otherwise he won’t be able to chew a single bite of that food. Once you have addressed any health issues that are causing the horse to lose weight, the next step is to create a diet that will nourish him but not create further digestive issues. Contrary to popular opinion, skinny horses do not need super rich, high fat meals in large quantity. Most skinny horses have such poor digestive tracts that they cannot process these kinds of meals. Instead, focus on feeding the thin horse small, frequent meals that are easily digestible. If the horse has low energy, you can gradually increase up to one-and-a-half pounds of grain or pelleted feed per 100 pounds of body weight. Adding some oil or rice bran to the diet can also help. Alfalfa can help the horse put on weight, especially if he is a picky eater or has ulcers, which makes him avoid grain. If the horse has high energy, it is best to feed less grain and more hay. Adding some vegetable oil or rice bran to the grain can also encourage weight gain. Soaked beet pulp also helps the high-energy skinny horse gain weight. Once you have created a diet suitable for your skinny horse, you may want to consider digestive supplements that can help your horse better digest his food. For instance, enzymes can help a horse get the most out of his feed. I have found that the SBG Zymes Plus from Simplexity Health support the digestive system along with having a warming effect, which is useful for thin horses. Probiotics also help with digestion, along with healing the gut and boosting the horse’s immune system. Excellent sources of probiotics includeacidophilus and bifidus from Simplexity Health, Fastrack from Conklin, PreProbiotics from Equilite/Arenus, and Pro-Bi (PrePro)and Pro-Bi from ABC. For horses who have been stressed or traumatized, the herbal product Eleviv from XanGo is an excellent supplement which restores these horses to their natural, healing, parasympathetic nervous system. Omega Sun blue-green algae from Simplexity Health is a good source of nutrition for these horses, providing dense nutrition without generating a lot of nervous energy. For general, broad-spectrum nutrition, the Simplexity Essentials are both convenient and cost-effective. These daily packs contain two forms of blue-green algae (with and without the cell wall), probiotics, and enzymes. 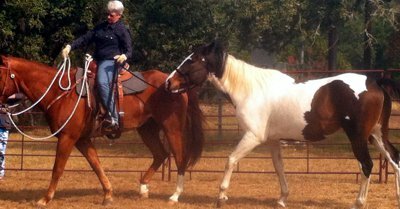 Thin horses thrive on 1-2 packs daily. Finally, you may want to consider digestive herbs such as marshmallow root, slippery elm, or aloe vera to give your horse’s digestive system a boost. Bringing a skinny horse from the brink of malnourishment back to glowing good health can be a long trek, depending on how many health issues you have to address. Luckily, a solid nutritional foundation can do wonders for skinny horses, once the major health issues have been addressed. For more information on feeding, nutrition, and holistic care of horses, skinny or otherwise, check out the Holistic Horsekeeping book.